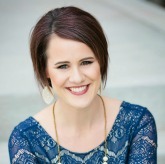 Katie Reid is a busy mom of five and wife of a youth pastor who readily admits she’s been made like Martha. I met Katie a couple of years ago as we crossed online paths in writing circles and immediately found her generous and encouraging. Her upcoming release, Made Like Martha, will help modern day Marthas embrace and tailor their strengths. Happy to welcome Katie today as the first in our summer author series. There is a scene in the movie Mary Poppins where Mr. and Mrs. Banks are trying to hire a new nanny for their children. A large number of potential employees are lined up on Cherry Tree Lane, outside the Banks’ home. All of a sudden, the wind picks up and blows the waiting nannies into the London sky. Mary Poppins then gracefully floats down from the clouds, using her umbrella as a parachute of sorts. She arrives at the front door of the Banks’ home—rosy cheeked and confident, carpet bag in hand. She quite literally blows away the competition. My dad used to reenact this “flying nannies” moment. Before bedtime my three siblings and I pretended to be asleep on the living room floor. As we waited, we closed our eyes and tried not to giggle as we anticipated what was to come. This childhood memory provides a picture of how our Heavenly Father relates to us in storms. He keeps a solid grip on us when we feel like we’re losing ours. He holds us steady amid the twists and turns. 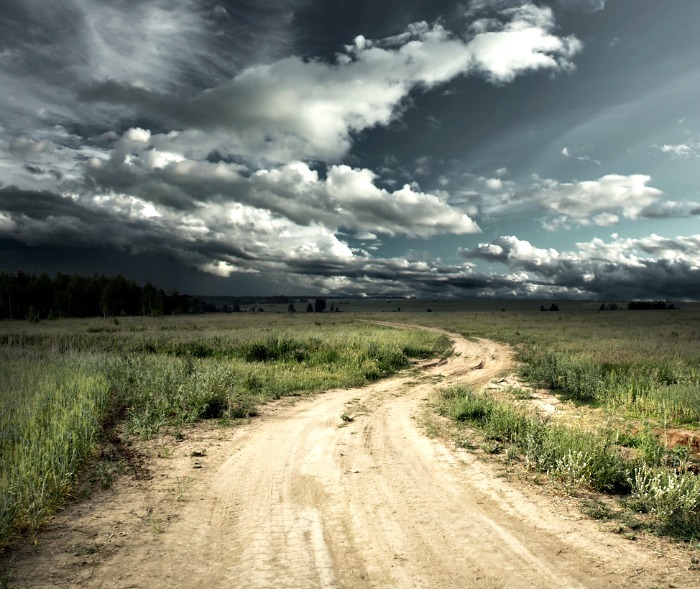 We may feel disoriented by the rushing wind, yet He provides solid ground in the midst of it. Sometimes solid ground takes the form of seas parting at the eleventh hour, or supernatural endurance when we face devastation, or a listening ear when we’re hurting. When we are blindsided by bad news, our tendency is to attack or retreat; fight or flight. We may wrestle with feelings of confusion, anger, and bitterness when we experience suffering. This is normal. Yet, when we face hardships, we have an opportunity to stand on what is true instead of being blown off course. Modern Marthas like me, have a natural inclination to try and fix things. We may give food for the hurting, offer solutions for problems, and expend our resources to help others. Being a recipient can be a challenge for doers. This is especially true when difficulties show up on our doorstep, demanding attention. We want to ignore them, avoid them, change them, fight them, or fix them—but we don’t like to sit back and ride out the wave of pain. We want to make the wind and waves stop, and quickly! We want to conquer, not be still or idle. We work hard to overcome problems and find the nearest exit out of painful circumstances. As sons and daughters of the King, we are dearly loved, saved and set apart, recipients of the lavish gift of grace. However, when life unravels, we’re tempted to overlook God’s goodness when the winds begin to howl and the rain starts to fall. Yet, He remains. A rock. A refuge. Always available, always attentive. Unchanging. 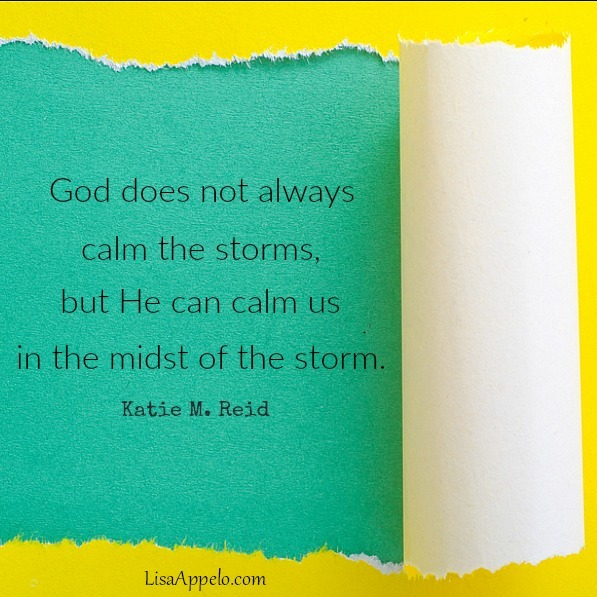 God does not always calm the storms but He can calm us in the midst of the storm. He listens to our prayers as the wind howls, He holds us close when the storm rages. He understands what we are going through…and He carries us through it all. Katie M. Reid encourages others to find grace in the unraveling of life at katiemreid.com. She is a devoted wife, mom to five loud children, and fan of cut-to-the-chase conversations over iced tea. She is also a national speaker and author of Made Like Martha: Good News for the Woman Who Gets Things Done (with a bonus 5-week bible study). You can subscribe to Katie’s blog and connect with her on Instagram: @katie_m_reid. *This post contains affiliate links. You can see my full disclosure here. What a great reminder that God is faithful to protect and comfort His children, no matter what storm surrounds us. So true, Tracey. I’ve asked God to get me out of the storm but so often, He walks with me in it. Yes, so thankful for His strength and presence. Thanks, Tracey. I loved this quote: “God does not always calm the storms but He can calm us in the midst of the storm.” and shared it on FB. Thanks, Katie and Lisa 🙂 And a special thanks to Lisa for your kind and encouraging words on my blog. Hi Dolly! Thank you so much for sharing. Glad you were encouraged. Hope you’re having a great summer. Absolutely beautiful and true, Katie. Thank you for these encouraging and grounding reminders.